1. Preheat the barbecue (griddle or grill). Toast the coriander and cumin seeds together in a dry frying pan for 1 minute until they start to pop and smell aromatic. Grind the toasted seeds using a pestle and mortar. Tip half of the ground spices into a large bowl, add the extra virgin olive oil, pomegranate molasses, crushed garlic and lemon zest and juice. Mix well and set aside. 2. Cut the cauliflower into large florets and blanch for 1 minute in boiling salted water. Drain well, tip into another large mixing bowl and add the regular olive oil, remaining toasted spices and trimmed salad onions and mix well to coat. 3. Char the cauliflower on the barbecue for 5-6 minutes or until coloured on all sides. Tip into the mixing bowl with the dressing ingredients. Quickly cook the salad onions on the barbecue for 2 minutes or until just softened. Slice each salad onion into 4 lengths and add to the cauliflower. 4. Add the barberries (or cranberries), chopped herbs and pistachios, season and mix well to combine. Leave to cool to room temperature. 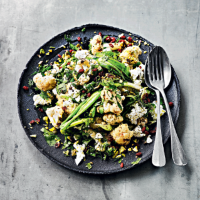 Arrange the cauliflower on a serving dish, spoon over any dressing left in the bowl, crumble over the goat’s cheese and serve.